All covers are by Guy Berard. A Curriculum of the Soul 0 (1968). First printing. Sometime after Charles Olson’s death in January 1970, I told Jack Clarke I wanted to publish some kind of tribute to Olson. He responded by sending me a copy of “A Plan for a Curriculum of the Soul” which Olson had sent to us for publication in The Magazine of Further Studies no. 5. On the copy Jack had selected 28 terms as “subjects” and to each one he had written the name of a poet who might write a “fascicle” using the term as a title. We agreed that he would request the text and forward it to me and that I would publish and distribute it. I imagined that the project would take about two years, but in fact it took thirty. Many of the fascicles were printed mimeograph, texts and covers. But as the decades passed I began to employ commercial printers. The issues were sold by subscription or through book dealers. Press runs were usually close to 300 copies. After the final issue (“one’s own Language” by Lisa Jarnot) appeared in 2002, I began editing the whole toward a single volume limited edition of 51 copies designed and produced by Michael Russem at Kat Ran Press and bound in Japanese silk by Sarah Creighton. The book was released in 2010 at the Charles Olson Centennial celebration in Vancouver. In 2016 a two-volume trade edition was published by Spuyten Duyvil press. A Curriculum of the Soul 23 (1983). 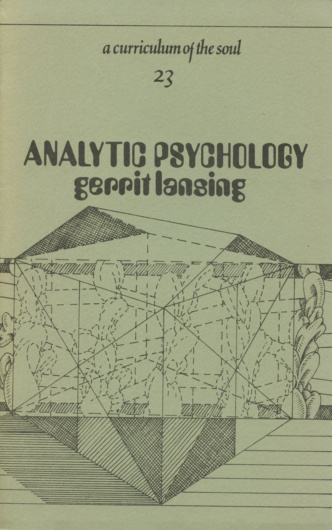 Analytic Psychology by Gerrit Lansing. A Curriculum of the Soul 5 (2002). one’s own Language by Lisa Jarnot. Billowitz, Edgar. American Indians. 1972. A Curriculum of the Soul 14. Blaser, Robin. Bach’s Belief. 1995. A Curriculum of the Soul 10. Boughn, Michael. one’s own Mind. 1999. A Curriculum of the Soul 4. Brown, Harvey. Jazz Playing. 1977. A Curriculum of the Soul 15. Butterick, George F. The Norse. 1973. A Curriculum of the Soul 12. Bylebyl, Michael. Ismaeli Muslimism. 1972. A Curriculum of the Soul 18. Clarke, John. Blake. 1973. A Curriculum of the Soul 7. Dalke, Robert, trans. Novalis’ Subjects. 1973. A Curriculum of the Soul 11. Duncan, Robert. Dante. 1974. A Curriculum of the Soul 8. Glover, Albert. The Mushroom. 1972. A Curriculum of the Soul 1. Grenier, Robert. Attention. 1985. A Curriculum of the Soul 28. Hadley, Drummond. Vision. 1972. A Curriculum of the Soul 21. Hollo, Anselm. Sensation. 1972. A Curriculum of the Soul 27. Jarnot, Lisa. one’s own Language. 2002. A Curriculum of the Soul 5. Kissam, Edward. The Arabs. 1972. A Curriculum of the Soul 13. Koller, James. Messages. 1972. A Curriculum of the Soul 22. Kyger, Joanne. Phenomenological. 1989. A Curriculum of the Soul 26. Lansing, Gerrit. Analytic Psychology. 1983. A Curriculum of the Soul 23. MacAdams, Lewis. Dance. 1972. A Curriculum of the Soul 16. McClure, Michael. Organism. 1974. A Curriculum of the Soul 24. McNaughton, Duncan. Dream. 1973. A Curriculum of the Soul 2. Notley, Alice. Homer’s Art. 1990. A Curriculum of the Soul 9. Olson, Charles. Pleistocene Man. 1968. A Curriculum of the Soul 0. Sanders, Edward. Egyptian Hieroglyphs. 1973. A Curriculum of the Soul 17. Thorpe, John. Matter. 1975. A Curriculum of the Soul 25. Tirrell, David. Alchemy. 1972. A Curriculum of the Soul 19. Wah, Fred. Earth. 1974. A Curriculum of the Soul 6. Wieners, John. Woman. 1972. A Curriculum of the Soul 3. Zimmerman, Daniel. Perspective. 1974. A Curriculum of the Soul 20.